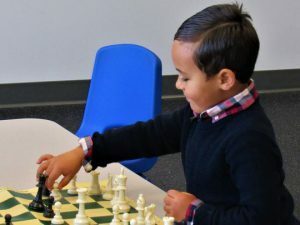 Chess is a game of strategy, requiring skill and concentration, but for kids at the Goddard School, it’s as simple as child’s play. 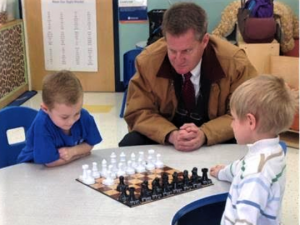 Preschoolers as young as 3 have taken up the game in a unique program called Chess at Three. They play regularly and hold matches; it’s one of the most popular activities at the school. Designed to make learning fun, each chess piece is a different character and has a story to go along with it. For example, the white king is “King Chompers,” who can eat 30 pizzas at once and has a big belly. He can move only one space at a time, just like the king in regular chess. 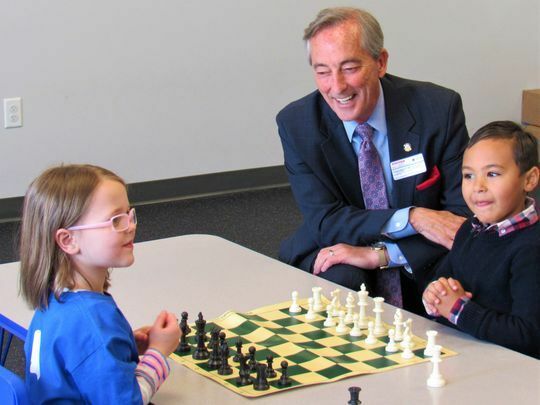 Other pieces have their own stories; the kids remember the stories associated with each piece and begin to play chess. Rachel Shearer is the teacher in charge of the program. “We have small groups that play a couple of times a week,” she said. “It’s free choice, so they decide if they want to play.” And they do want to play; the engaging “fairy tales” appeal to the kids and the stories stick with them. The school is decorated with a nautical theme; classrooms are named for sea creatures like dolphins, guppies, jelly fish and sea turtles, making them easy for kids to remember. “The school can accommodate 172 students and is near full capacity now,” McCarren said. She recently added three new classrooms and a multipurpose room. Farragut also has a Goddard School, 125 Loudoun Road. The two locations sometimes get together for Chess for Three tournaments. What do the kids say? Lily Fisher likes to play “because of all the different stories and moves they have.” Veteran player Cameron Bogus likes the characters; when asked about his favorite, he was quick to answer “Ironman!” Ok, that’s not a chess piece, but who can blame him for getting caught up in all the excitement? The HV Goddard School sponsors quarterly community service projects. A canned food drive for Second Harvest runs through March. They are already planning their Fall Festival, where donations will benefit East Tennessee Children’s Hospital. Kids love games, so you can try this at home. Any chess set will do, but you’ll have to provide the imagination. More info at goddardschool.com.